When heavily pregnant Ali De Strang presented herself to her local hospital in Central Queensland, she was told the new, state-of-the-art facility was “for emergencies only”. She was to spend the next three weeks travelling hundreds of kilometres (about 1370km) before the arrival of her second baby boy, eventually born at 5.17kg (11lb4oz). 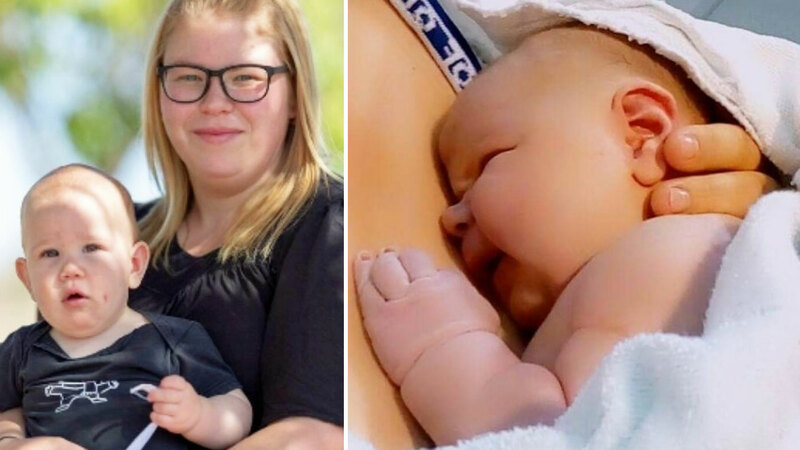 The 25-year-old mother told nine.com.au she could have easily had Layn at her nearest hospital in Theodore but the birthing suite was closed. Central Queensland Hospital and Health Service said a reintroduction of normal birthing services at Theodore Hospital would present an unacceptable risk to women because of the distance involved to specialist services. In 2016, the hospital held a grand reopening following a major refurbishment, which included a brand new birthing suite. And despite the community assisting in raising the last $70,000 needed for the redevelopment, it is not used for regular births – the closest hospitals for 24-hour maternity care are Gladstone and Rockhampton, both more than 250km away. Ms De Strang was three centimetres dilated when she attended the hospital at 36 weeks and said doctors gave her drugs to stop labour coming on. “I felt like I was having contractions,” she said. “But I was given medication to stop me going into labour. She was then transported to Biloela Hospital - 105km away. After a check, she was told “it’s going to be a big baby” and was sent home. Ms De Strang did the 210km round-trip for weekly checks but at 39 weeks, the hospital staff said there was no obstetrics cover and that she would have to drive to Gladstone, 265km away, to give birth. Her partner, Dylan Jones, 25, was away for work 1400km away. Her mother and two-year-old son, Zander, did the trek to the major hospital with her. “My son was in the room in the labour suite because I had no-one to care for him back home,” she said. “He was quite traumatised by it and vomited on the floor. Within a couple of hours of being in labour on November 28 last year, Ms De Strang had given birth to not-so-little Layn at 39 weeks and six days. “I should’ve had a caesar but I was never offered one and it was too late,” she said. The mum from Isla said she now suffers from post-traumatic stress disorder. She also said the travelling, fuel costs and delivery caused a lot of stress. Her partner also lost his job as he was forced to care for her, Zander and Layn for three weeks while Ms De Strang recovered from the ordeal. “I was very sore and had back problems because Layn was so big,” Ms De Strang said. “When he was born, he wasn’t breathing and was stuck. He had shoulder dystocia. Ms De Strang is urging for Theodore Hospital to open its maternity ward and to “go back to accepting low-risk patients”. She said she has now changed her mind about having any more children following the the whole experience. Central Queensland Hospital and Health Service chief executive Steve Williamson told nine.com.au the birthing service at Theodore Hospital had not been reintroduced due to an “unacceptable risk”. “Theodore Hospital continues to provide comprehensive antenatal and postnatal services,” he said. “The decision not to reintroduce birthing services at Theodore Hospital after a seven-year absence was made by senior clinicians based on an unacceptable risk to women and their babies due to the distance involved to specialist services. “The level of demand in Theodore is not sufficient to allow clinicians to maintain currency of their practice. Contact reporter Kimberley Caines at [email protected].